Bournemouth returned to the top of the Championship on goal difference, despite being held by Huddersfield. The Cherries are level on points with Middlesbrough and a point clear of third-placed Derby, both of whom are in FA Cup fifth-round action this weekend. An excellent set-piece routine was finished off by Yann Kermorgant to put the hosts in front before half-time. 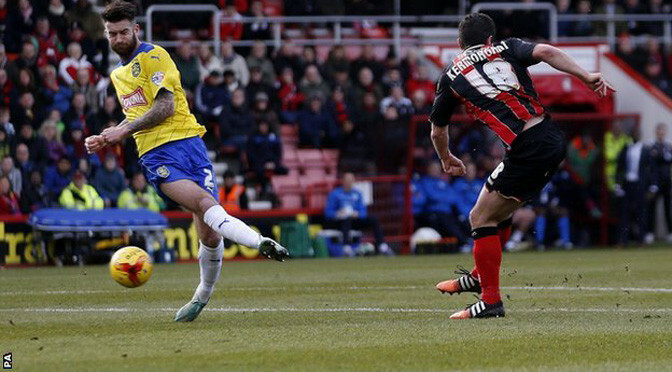 But Huddersfield striker James Vaughan turned in Jack Robinson’s shot midway through the second period to level. The visitors responded well to their 4-1 home defeat by Wolves in midweek, producing a superb battling display against a Bournemouth team that have now drawn consecutive home games. Huddersfield made a bright start but it was the hosts who created the majority of the game’s early chances. Defender Steve Cook and striker Kermorgant sent headers off target for Bournemouth, who won 4-0 at Huddersfield on the opening day of the season, while Terriers goalkeeper Alex Smithies made saves from two Matt Ritchie attempts either side of Kermorgant’s opener. That goal came when Matt Ritchie’s corner was played in low and Harry Arter allowed the ball to run through to Kermorgant, who drilled low into the net. At the other end, Cherries goalkeeper Artur Boruc kept out Tommy Smith’s curling shot, but Huddersfield chances were rare despite their continuous endeavour. And Vaughan’s equaliser, his third in as many games, came against the run of play after Bournemouth had dominated possession for large spells in the opening stages of the second period. The impressive Smithies made further saves from Kermorgant, Ritchie and Arter, while Callum Wilson had an effort cleared off the line in the closing minutes as Bournemouth searched in vain for a winning goal.